In a previous article, we examined what is Affiliate Marketing, and in another one, we took a look at the history of this business model. We underlined that this specific industry is only growing since its inception, back in 1989. Now it’s time to illustrate some statistics that will help us better understand the future of affiliate marketing. A very important statistic showing the real power of this advertising model. It seems that the USA is a saturated market, but this means untapped opportunities for the rest of the world. Europe is the 2nd in the list, with only 15%, so imagine the potential for the rest of the countries. When someone goes to Google and searches for “product name reviews”, they are already in buying mode. 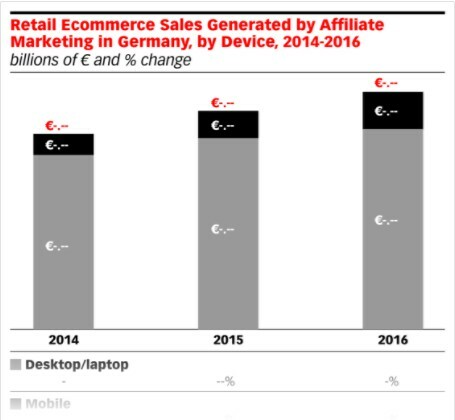 Affiliate marketing now drives as many e-commerce orders in the US as email. This makes affiliate marketing one of the four largest sources of e-commerce orders, outperforming social commerce and display advertising. It’s crucial for marketers to use click-to-call buttons that are displayed in the search results. This easy-to-use method saves time for mobile users. What can we learn from these statistics? What is the future of Affiliate Marketing? Sales are increasing, the ad spending increases, almost every brand uses this model. Companies use this method to reduce their costs and to increase their customer base. Affiliate marketing is now so strong that can be compared to email marketing. It’s a convenient method and most of the affiliates are working from home. Categories that will thrive are digital media, fashion, sports, beauty, and travel. The mobile-first world indicates that pay-per-call affiliate marketing is the new ‘Hot’ trend. Mobile searchers use their phone immediately to call a business from the search results pages. I believe that the number of affiliates will continue to increase, and I really hope that more affiliates from developing countries will enter the market. There are unlimited opportunities everywhere for all the affiliates and companies. People continue to spend money on their favorite products and services, and online sales are increasing year after year. …still, there are some pieces of the puzzle missing. PS I will continue adding new statistics to this thread in an attempt to cover all the possible questions. What do you think? What is your resume from these statistics? I would love to hear from you. I cant believe there are no comments here! This is reallly amazing! I love the stats. I have to present affiliate marketing and this will really help. Even the article on history of affiliate marketing!~Thanks a lot! Thanks so much, Summaiya. Very kind of you, I’m glad I could help.